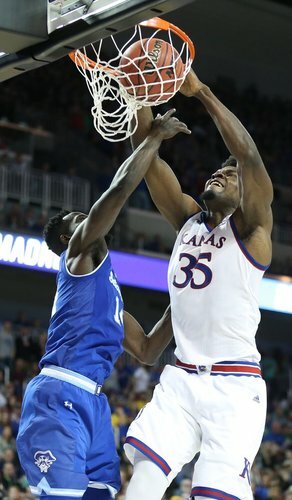 We've reached the 'Udoka Azubuike is going to dunk everything' portion of the game. Standing ovation for Udoka as he walks to the bench. 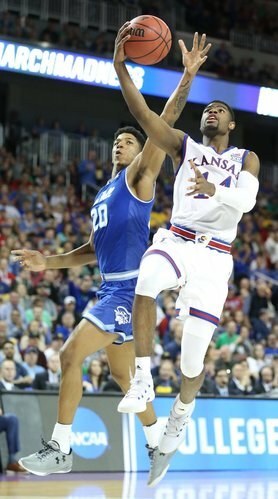 KU is shooting 4-5 in the 2nd half. Self signaled for Lightfoot to sub in as soon as Udoka finished that 2nd jam of 2nd half. Nice pump fake by Myles Powell. Offenses coming alive in the second half. Svi with the left handed jump hook - wowzer! Delgado loves his matchup vs. Lightfoot. Udoka checking back in after media timeout. Think Self has to at least try De Sousa again. Lightfoot hasn't been able to do anything with Delgado. Udoka is such a difference maker in this game it's ridiculous. We can win without him but we would be winning handily with him at full strength. Delgado with 15 rebounds, six offensive. Azubuike wanted the ball bad there. His face said it all as he basically begged for a post feed. Garrett is now shooting better than Doke from the line. Graham QB pass on the run ahead for streaking Newman. Layup for 44-34 #KUbball lead. Third foul on Desi Rodriguez. It's kind of incredible, but Delgado's body language has changed entirely with Azubuike in. Not even attacking the glass. Doesn't know what to do with him. Another great dish by Udoka to Lagerald Vick. Azubuike has put on a passing clinic today. Seton Hall has no answer right now. Jayhawks up 12 with 14:22 to play. Perfect timing between cutting Vick and dishing Azubuike. Big man's 2nd assist out of a post-up. Another terrific pass by Azubuike, this one to Vick, and #KUbball leads 46-34. Timeout Seton Hall. Jayhawks really clicking right now. 14:22 to play. One more from the "How 'bout that" file... #KUbball is just 3-of-13 from 3-point range so far. Graham isn’t scoring but he has 5 dimes and 2 rebounds. He just needs to steer clear of the No 35 bus! Carrington hits a 3. KU still up 9.